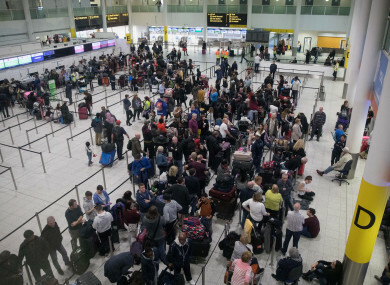 AN “INSIDER” WITH knowledge of how Gatwick Airport operates may have been responsible for the drone attack which caused travel chaos and left thousands of passengers stranded before Christmas, police have said. Speaking to BBC Panorama, Sussex Police said the inside job possibility is currently a “credible line” of inquiry. Several reports of drone sightings at London’s Gatwick airport during the Christmas holiday season sparked the suspension of around 1,000 flights, and affected over 100,000 passengers. The sighting of a drone at Dublin Airport caused flights to be suspended for 30 minutes in February, and the chaos at Gatwick in December had sparked concerns that a similar incident could happen at an Irish airport. He added that whoever was piloting the drone could either see what was happening on the runway or was following the airport’s actions by monitoring its communications. The person responsible for the attack has not yet been found. Woodroofe also dismissed claims that there was no drone at all, and police said there had been at least 130 credible drone sightings over the period of disruption. The incident led the UK government to expand the no-fly zones around airports. Transport Secretary Chris Grayling said penalties for breaching these laws will range “from significant fines to a life sentence”. Police will also be allowed to fine users up to £100 (€112) for failing to comply when instructed to land a drone, or not showing registration to operate a drone. Email “Gatwick Airport drone chaos was possibly an inside job, police say”. Feedback on “Gatwick Airport drone chaos was possibly an inside job, police say”.